Compact, durable and meticulously crafted, the Fielder Mini Plain Edge folding knife from SOG is a ruggedized work of art. 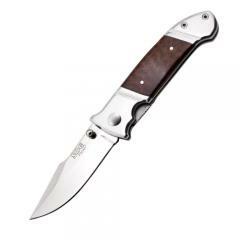 Featuring a hand selected, vertical wood handle, the knife is perfect for showing off as part of a collection, yet maintains the tactical functionality essential to backwoods expeditions. A durable, 7Cr13 stainless steel blade has a razor-sharp edge and is able to tackle any task. The handle employs machined finger grooves for superior handling, while a low-profile liner lock system protects users from accidental injuries. The addition of an integrated pocket clip ensures the Mini Fielder is always close at hand and ready to go at a moment's notice.